I guess with the revival of 2005’s Star Wars: Battlefront 2 Classic (even if has some kinks to work out), dusting off your old multiplayer favourites is just a thing this week. On Thursday, FireFly Studios gave their also-2005 (weird coincidence) castle-building/besieging RTS Stronghold 2 a fresh lease of life in the form of the new Steam Edition, including restored multiplayer, integrated Workshop map-sharing support and some slightly shinier graphics. Castle walls and siege tactics got your brain buzzing? Here’s some more strategy classics. If you’re not familiar with the franchise, you probably should be, at least with the earlier games in the series. The Stronghold games remain distinct among RTS’s for their laser-focus on the art of medieval fortress design and conquest. 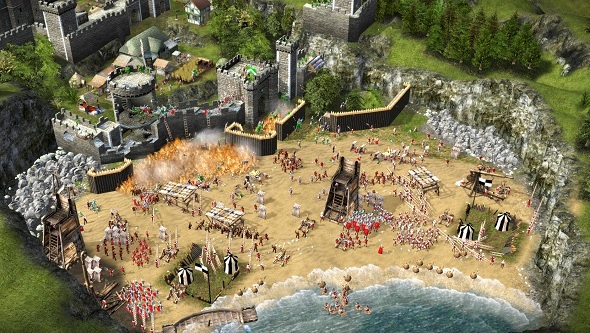 Build walls, towers, places for your archers to hang out and pour pots of boiling pitch on your foes – you know the stuff – but unlike the Total War series, you have full control over where you place each piece of wall or guard. It’s very granular, and very satisfying. Stronghold 2 was fairly well received when it first launched over a decade ago, with some feeling it fell a bit short of its predecessor and its standalone expansion, Stronghold: Crusader. Still, public opinion on the second game is far more positive than on the third, which was largely panned for its multitude of bugs and questionable design decisions. Given that the original titles have already seen multiple relaunches, this seems the logical next one to polish up and thrust back into the world. While the response to this relaunch seems to be quite broadly positive, and there’s a good number of players online at present, there are some grumbles from the crowd in Steam reviews and Youtube comments. Most common is pointing to the lack of bots in multiplayer, so if you’re hoping for a comp-stomp, you’re looking at the wrong game. There’s a few complaints about the new graphics, with some feeling they’re not quite the upgrade they should be. Stronghold 2: Steam Edition is available now for £12/$12.74 (that doesn’t sound right…), with a 10% re-launch discount available until October 12th.